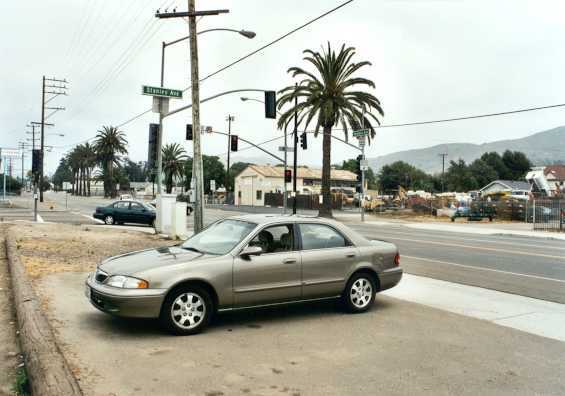 For 10 days I roamed around California in a rented car, trying to see as much as possible. 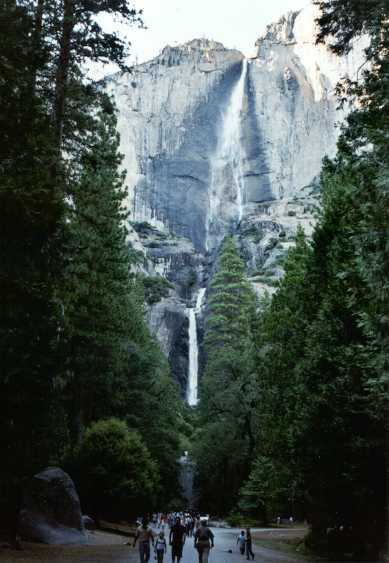 In particular, a had a look at Los Angeles, Hollywood, San Francisco, and the Yosemite National Park. 10:50 Now I have my rented car. Hertz has no car in the cheapest rate I already paid for, so I get a bigger one, a Mazda 626 LX with air conditioning, radio with cassette and CD, cruise control, power windows, air bags, etc. 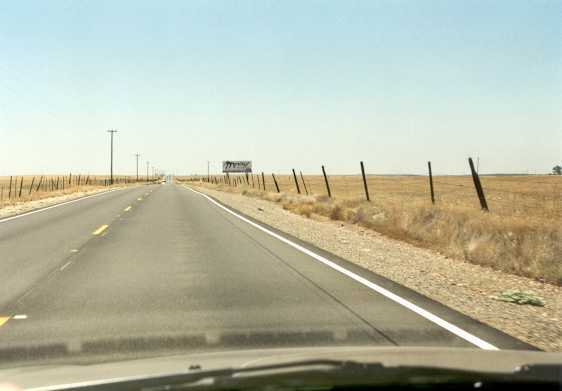 11:32 [0 miles] After carefully studying the car's manual (especially the things related to the automatic gear shift and the cruise control), I head first for Ventura Highway 101, and then for the Pacific Coast Highway 1. 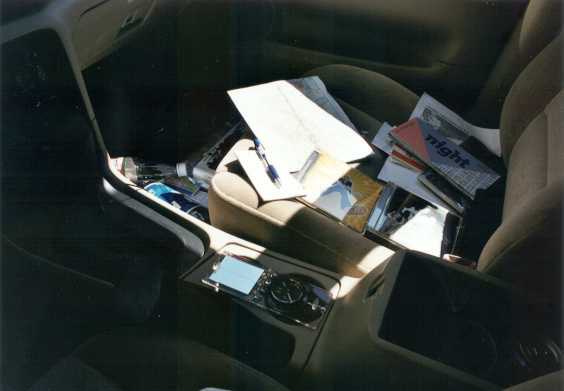 Actually, the automatic gear shift is quite nice, since you can do a lot of things with your right hand while driving, like writing, fetching maps, drinks, candy bars, taking pictures. Kids, don't try this at home! 12:22  Somehow I have lost Highway 1. I stop in some industrial region somewhere between Ventura and Oxnard. Hmm, I should have bought a precise map. Thank God I have a compass, so by going South and East I can't go wrong. 12:38  At Ventura I find a bunch of shopping facilities and buy some water, candy bars, a phone card, and yes, some maps. Lunch is a Whopper. 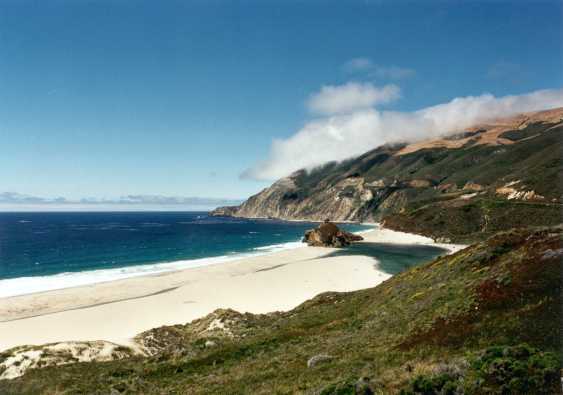 13:25  I continue my trip and quickly find back to Highway 101 and soon after that Highway 1. 14:02 I take a photo. 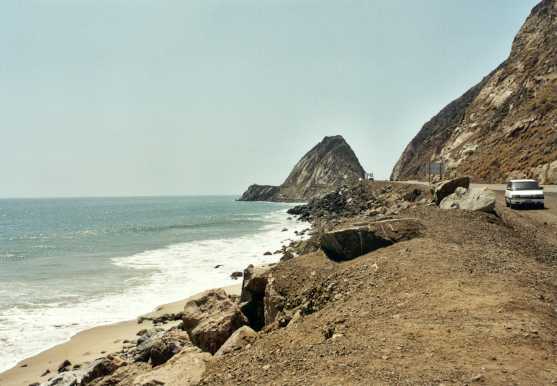 14:25  I take a little break at Point Mugu, take a picture, and change to shorts, since it's really getting hot now, and I don't want the air conditioning running all the time. 14:50 The police are making radar speed checks. I hope I was not too fast. 15:32 I leave Highway 1 and drive up Sunset Boulevard. Very curvy. 16:07  Not completely sure if I'm still on the right track, I turn into a small street, park and have a look at the maps. Yes, still looks very good. I return to Sunset Boulevard and soon drive North on the 101, towards the Universal Studios. 16:34  Okay, I'm in a parking garage of the Universal Studios. I spend the following hours at the Universal Studios. First I queue up for the studio tour. The studio tour is nice, and I happened to get a VIP ticket for this, allowing me to skip some of the waiting queues and to sit right in front directly behind the driver (Greg) and the guide (Lindsey, see picture. At the right you can see the entrance to ``Lyon Estates'', used in the three ``Back to the Future'' movies). The narrating along the tour is done partly by the guide, but also many film clips are shown on TV screens in the car. Among the things I learn is that the sets for western movies are built in a 90% scale to make the actors look taller. 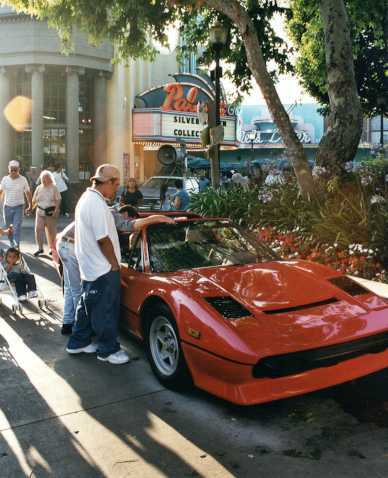 After the tour I walk around the park, have a look at several shows, e.g., a ``Foley Show'', where the creation of sound effects is presented, take a picture of the cars used in ``Magnum, P.I.'' 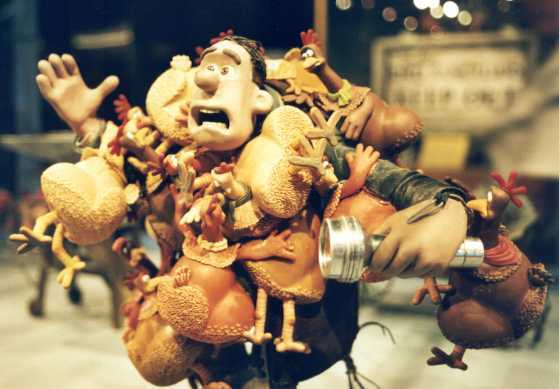 and ``Blues Brothers'', and visit an exhibition of the animation works of the new Aardman movie ``Chicken Run''. I finish with one of this day's last Terminator2-3D shows, which is really marvelous. 22:32 Back at the parking lot, I try to memorize the way to La Brea Avenue, where I have two hotel suggestions from my guides and from Yassine. 22:40 Okay, off we go. No problems occur, and since the traffic is kind of slow on the 101, I have enough time to think about which lane to choose etc. 23:30  I got a room at the Holiday Inn Express, 1520 North La Brea Avenue. They have a garage where I can park the car. 09:30 I get up. And yes, the shower is HOT! 10:10 Breakfast. All plates, cups, etc. are made of plastic and paper, maybe some of the food, too. 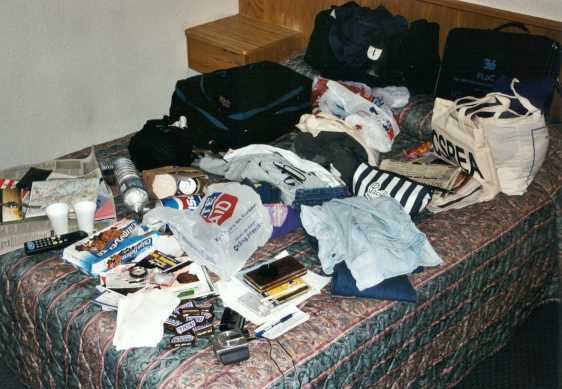 10:35 I collect my stuff, check out, make a careful plan which streets to take (Hollywood Boulevard, Los Feliz Boulevard, San Fernando Road, Alameda Avenue), and leave for the NBC Studios at Burbank. 11:58  I arrive at the NBC Studios and buy a tour ticket for the 13:00 tour. Plenty of time until then, so I can check the toilet acoustics (which is disturbed by a squeaking child). 13:01 The tour starts. In comparison to the Universal Tour, this is much more interactive, personal, and the guide is more motivated. Nothing is faked here, and you actually see people working on sets, for instance. Among others, the sets of the comedy show ``Days of Our Lives'' are shown. On most sets there a two doors, a big one for the actresses to enter, and a small one for the actors, used to make people look smaller, respectively, taller. 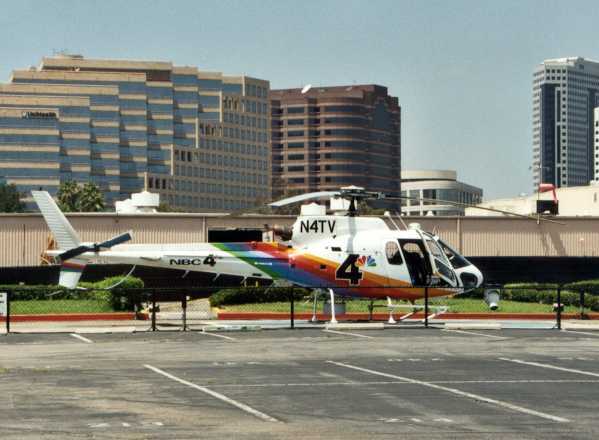 Also the studio for the talk show ``The Tonight Show with Jay Leno'' is shown. Unfortunately Jay is on holiday this week, so there is no chance to attend a taping of his show. 14:15 The tour is over. I go back to the car and head towards Hollywood Boulevard. 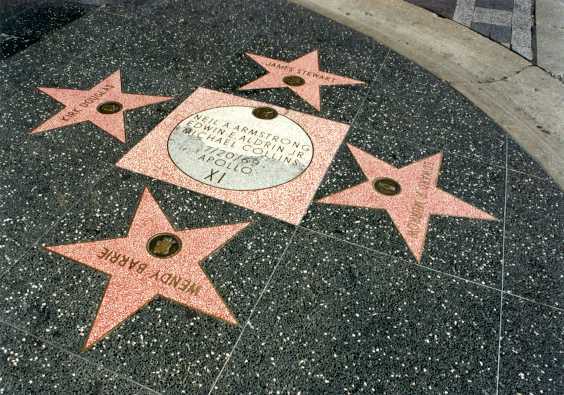 15:31  I walk along the famous ``Walk of Fame'' with the names of many, many entertainment celebrities. Also the crew of the Apollo XI moon mission is honored here. 18:39  After searching a bit for motels, I make some phone calls and finally end up at the Travelodge Santa Monica, Pico Boulevard. Again, it is not cheap, but it's only for one night, and I can't search forever. The car's tank is half empty now, so one filling suffices for about 340 miles, which is not much. This is a major drawback in having a bigger car than planned. 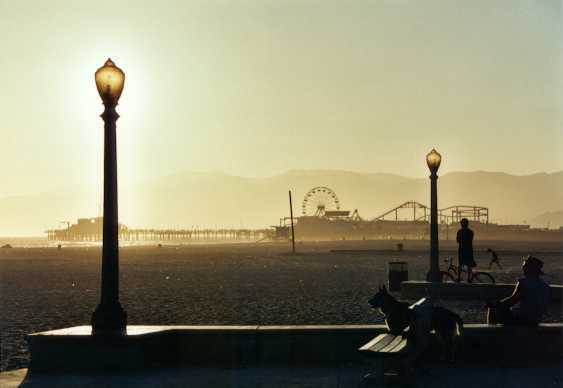 19:05 I drive to to Santa Monica beach. The sun is setting slowly, and a strong wind is blowing from the Pacific. So it is actually a bit too cold to take a bath. 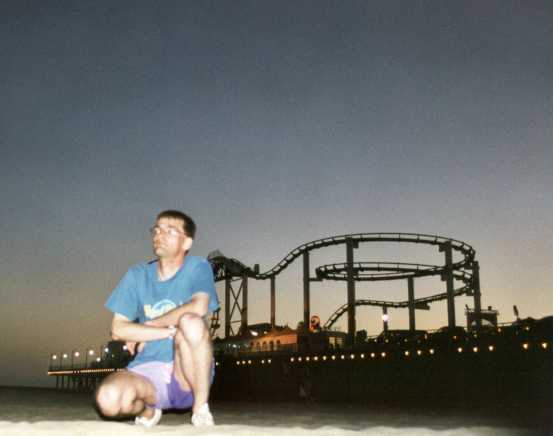 I walk up to the famous Santa Monica Pier with the Pacific Park on top. 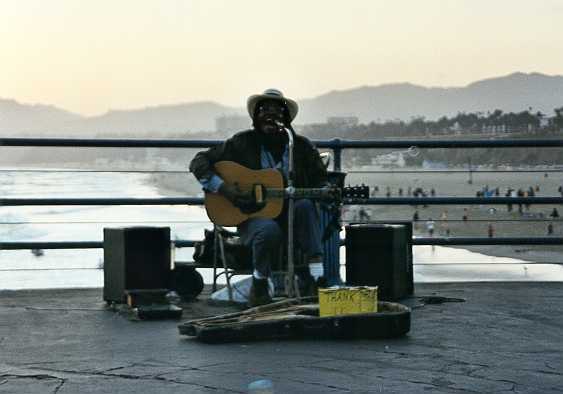 In the fading sunlight a man is singing along his guitar. I listen a bit and then enjoy a roller coaster ride. Since is is not very crowded at this time, you get two rides for one fare. 20:59  Finally, I take a look at the ``3rd Street Promenade''. A parking garage is provided for free, how nice. The street is crowded, and many people are playing various kinds of music, e.g., classical piano or traditional Asian. 22:34 It was difficult to find the car, since I did not notice that there were two different parking garages next to each other. There's not much traffic, so I get back to the hotel very quickly. 22:57  I'm back at the hotel. As usual, I write the report while watching some TV, e.g., ``Star Trek: Voyager''. 09:15 Independence Day. Happy 224th birthday, USA! I get up and decide to have breakfast before taking a shower, since it is provided only until 10:00. Breakfast is not very good, just toast and some cakes, no cereals. 10:30 The phone rings. It's the reception, reminding me that checkout is until 11:00. Weird. As if I would do the check out in the last minute. 10:59 I check out, with some ice cubes in my bag. These I put into the small storage place between the two front seats in the car, thus keeping my chocolate stuff cool during the day. 11:20 After checking the routing, I leave Los Angeles behind and move west again. 12:00  I stop at Malibu Lagoon State Beach and relax a bit in the sun. At Radio Shack, Malibu Creek Plaza, I buy an adapter for my MiniDisc player to use it in the car cassette player, because I can't stand anymore the radio stations, many of which just play country, western, and commercials. Furthermore, the reception is often very bad near hills. And in California, there are hills virtually everywhere. 13:20 I move on, listening to Tori Amos from MiniDisc. 13:45 For the first time I use the cruise control. Quite nice, if there is not too much traffic. 14:45  Ojai, Oak View. I have lunch at McDonald's. Finally, I know that a dime is 10 cents. 15:24 Back on the road, with Bobo In White Wooden Houses playing. 15:35  I take two pictures at Casitas Lake, finishing the second film. 16:35  I fill 11.979 gallons (45.341 liters) of 87 octane unleaded fuel into the car, paying directly outside with my credit card. So the Mazda consumes about 4.2 gallons per 100 miles (9.8 l/100 km). 17:16  A short break at the Gaviota Roadside Rest. 17:35 Now it's time for Roxette while I drive on. The sun is starting to set, and the light is getting very distracting with respect to driving. 19:07  Another break, this time at Morro Bay. For taking pictures, the light is nice. 19:45  The road to Hearst Castle is closed since 18:00. Maybe I'll come back here tomorrow morning. 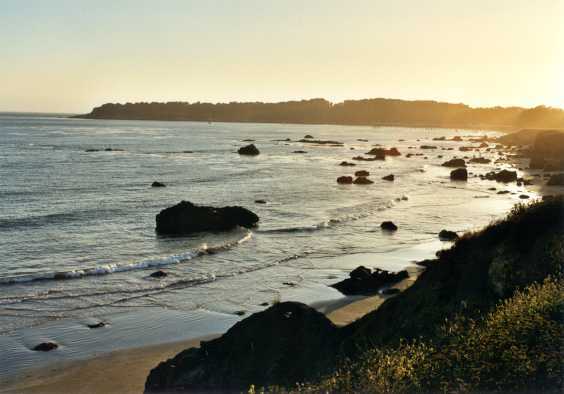 I drive back to San Simeon, through which I just had passed. 20:05  I get room number 264 at the Courtesy Inn at San Simeon. Since my sport shoes got soaked with water at the beach and since they are very old, they emit a really disgusting smell. So I put them outside next to the door. 09:30 Something is wrong with my alarm clock, which I bought just for this journey. At wakeup time, it just makes a small `ping' and then remains silent. It behaved differently before, but now I can't trust that thing. At least the shower is nice. Breakfast is not included in the room price, just some hot drinks. So my breakfast is a cup of tea and a candy bar. 11:45 I check out and leave, nearly forgetting my smelly shoes outside. I go back to my room - but they have disappeared. Well, they were very old, broken, and smelly. So I don't care. It must have been an olfactorial trauma for the one who removed them. 11:58  Back at Hearst Castle. But a visit is only possible in a guided (and paid) tour which takes about two hours, and the castle is not very interesting, as I see from some pictures on display. So I just take a few pictures and leave, listening to Supertramp. 12:32  I take some pictures at the Piedras Biancas Lighthouse. From now on, the Coastal Highway 1 starts curving around hills at the coast, which is very beautiful, but also not very fast (around 35 MPH average), and somewhat exhausting. I guess the other direction (south) is even a bit nicer, because then it's easier to stop at nice spots, because these are all on the coast side, which is right when you go south. 13:03  Time for a panorama picture. 13:17  And some more pictures. Strong winds are blowing, but the overall temperature is okay. So I don't need the air conditioning, which saves some fuel. 13:53  Some road work is going on, and I have to stop for some minutes. I turn on the radio, but there is only one station, which plays a jazz/swing kind of music. 14:23  A quick stop at the Big Sur Station in the Pfeiffer Big Sur State Park, part of the Los Padres National Forest. 16:12  Some shopping at the Rancho Del Mar grounds in Aptos (near Santa Cruz). I buy some cookies, tortilla chips, and a map of the San Francisco area. I have lunch at KFC, but it does not taste very good. 17:12 Consulting the map I realize that I'm a bit off to the west, I should have taken the 101 some miles before Santa Cruz. I reroute via the 17 and 85, direction Mountain View. 18:25 At Palo Alto I stop at a gas station to have another look at the map, since I want to find a hotel near Compaq. Some homeless guy comes up to my car and offers his help. He tells me where to find some hotels. As he also offers to clean my windows, so he does, and I pay him $5. Maybe this is far too much, but I've been ripped off at various hotels before, and this guy has been very helpful. 18:50 I get a parking lot at High Street, very near Compaq. I walk around, and two hotels are full. The third one seems more expensive. 19:10  Okay, an expensive hotel again, Cardinal Hotel. Small but nice room (number 227). Dozens of TV channels, and the hotel offers an unlimited Internet connection for $10 a day. I cannot resist, and it is a wireless PCMCIA LAN card for my laptop (connecting to some hotel computer, I guess), that's nice. Transfer rates are about 50 kbytes per second, amazing technology. Drivers are only supplied for Windows, but I can live with that. Maybe I should stay here also for my second night at Palo Alto. I ask at the reception, but the hotel is fully booked tomorrow. 21:00 The TV show Big Brother has reached the States. The first show just started. The music played at the beginning and the end of the show is quite similar to the Dutch and German version. 00:05 Using the UNIX talk program, I chat a bit with Martin and Jan. Actually not only a bit, so I get to bed quite late. 07:40 I get up and take a shower. A shared shower is in the hall, and fortunately it is not occupied. No breakfast is served, just hot drinks 24 hours a day. So I take a cup of tea and eat two chocolate cookies from my private reserves. While I'm having breakfast, I chat with Ralf via the Internet connection. Since it gets very late and I want to be at Compaq in time, I have to hurry. I want to read my emails at Kiel later, so I download them onto my laptop. However, time is short, so I do that while sitting on the toilet. Amazing technology. And I mean not the toilet. 08:48 I leave the hotel, having in mind that I have to checkout at noon. The times at the parking lot are restricted, so I have to take the car, even for the very short distance. How American. 09:00  Punctual as a German can be, I arrive at the gate of Compaq. Provided with detailed information, I manage to park my car and get inside the building, where I register as a visitor of Leslie Lamport. I don't want to get into details of the visit, but it was quite pleasant, and a talk by another visitor from Nijmegen (his name was Bart) showed me that Compaq/Digital knows how to build excellent conference rooms. 11:38 Leslie Lamport has to leave the talk a bit early. I also go, because I have to check out at the Cardinal Hotel. There I am informed that there another room has become available, so I stay for another night. The new room is even more expensive, but has a private bathroom. 13:51 I call the NASA Ames Center at Mountain View and ask for a visitor's tour. Unfortunately, they do not provide tours anymore. However, the visitor center is open from 08:30 to 16:30. I'll have to check on the web if it's worth going there. 15:36 I store my notebook in the hotel safe and walk to Compaq again, since my car is still there in the visitors' parking lot. I move the car back to the parking space at High street. Then I walk along University Avenue, which is the main shopping street here. I buy 3 CDs and a used vinyl single. For lunch I buy a sandwich at a store called Subway. 17:45  I'm back at the hotel, fetch an Earl Grey tea from the lobby, and make myself comfortable in my room. Comfortable means watching TV while eating: 18:00 Simpsons, 18:30 3rd Rock From the Sun, 19:00 Friends, 20:00 Big Brother, 21:00 X-Files. 22:08 I must be mad watching so much TV. So I go out again, and have a look at University Avenue in the dark. Many people are on the road. A store with sports memorabilia has a basketball signed by Kobe Bryant on display: $459. I also have a look at the Borders bookstore. 22:58 Back at the hotel, I fetch my notebook from the safe, get another tea, and go upstairs into my room. 00:15 I have a talk with Karsten at Kiel, later also to Kai and Ralf. 00:35 I type and upload the next update for this report. Since I had the Big Brother live video stream running on my notebook for two hours or so, this night's download volume sums up to 40 megabytes. But who cares, it's a flat rate. 09:25 I get up, take a shower (private bathroom), and try to connect to the Internet once more, which doesn't work. Okay, bad luck, can happen. As I close the door to go down to the lobby, the key breaks into two pieces. Hmm, bad luck again. 10:00 I have to leave the parking lot now, so I check out, also give back the PCMCIA network card, go to the parking lot, and drive north, direction Menlo Park. It's a bit cloudy today, so there is no need for sunglasses. 10:38  I arrive at the visitor parking space at SRI International in Menlo Park. My appointment with John Rushby is at 11:00, so I have some time for breakfast, which consists of Pepsi and chocolate cookies. 10:55 Skipping through the heap of papers, maps, CDs, MDs, and other stuff inside the car, I realize that I forgot to return the manual of the network card to the hotel. Bad luck. 10:58 Okay, I walk into Building A of SRI. During the day, I repeat my talk which I gave in Las Vegas, have some Thai cuisine for lunch with Mr. Rushby and seven of his colleagues at ``Siam Garden'' (1143 Crane Street), listen to a talk by Jean-Pierre Jouannard, and discuss with Mr. Rushby about the work at SRI, my work, sightseeing in San Francisco, hotel prices ($70 seems to be rather cheap here! ), and lots of other stuff. 17:41 I leave SRI. It's too late to go to the NASA Ames center, so I drive back to Palo Alto. 17:50  12.596 gallons of 87 octane unleaded fuel. 18:30  Palo Alto, parking at High Street again. I go to the Cardinal Hotel again, return the manual, and since I know now that this hotel isn't that expensive, I check in for the third night. 21:22 I'm sitting in the Aquarius movie theater. Quite a small one, nevertheless it costs $8.50. The movie is ``Love's Labour's Lost'', the latest Shakespeare adaption by Kenneth Brannagh. 21:38 After some trailers, the movie starts. Not one of Brannagh's best, that's for sure. 23:09 Fin. I go back to the hotel. 09:35 I get up, check out half an hour later, not forgetting the ice for the car storage, and walk to the car. The sun is shining brightly. 10:29 Time to move to San Francisco. So I head north on the 101. 11:12  I am somewhere in the northeast of San Francisco, and have to stop somewhere to check the maps and find out my current position. 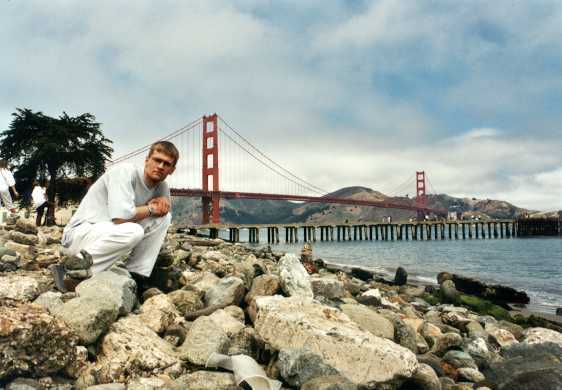 11:28  I decide to have a look at the Golden Gate Bridge from the shores of San Francisco Bay. 11:50  And so I do, getting a nice view on the bridge, San Francisco Bay and Alcatraz Island. 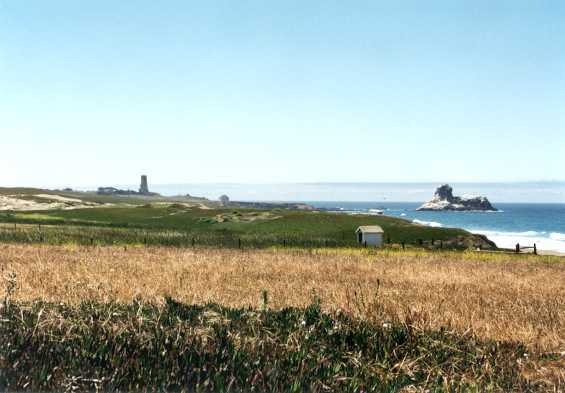 There are two small sheds nearby which were used in World War II to produce sea mines for the defense of San Francisco Bay. 12:24 I cross the Golden Gate Bridge north, and try to reach the parking space on the other side, because I want to walk on the bridge. But it is closed, and so I drive back to the southern side and park there. Since one has to pay for all bridges around here only when driving towards San Francisco, this parking lot search costs me a toll of $3. 13:06 I walk a bit on the bridge. Very strong winds up here. Actually the bridge is not very big, but nevertheless somewhat impressive. To the west, there is the Pacific, and to the east, there is the San Francisco Bay. 13:58 Crossing the bridge north again, I enter Marin County. 14:13  Lunch at Sausalito. Lasagna, not bad, but I spill some tomato sauce on my trousers. Having finished, I try hard to decide where to go next. Okay, I will go around the bay. 15:26  On Richmond Bay Bridge the traffic flows on two stories, one for each direction. After the bridge, I drive south trough Berkeley and Oakland. Then I take the Oakland Bay Bridge (also two stories) back to San Francisco. 16:27  Directly behind the bridge I get a room at the Bay Bridge Inn. 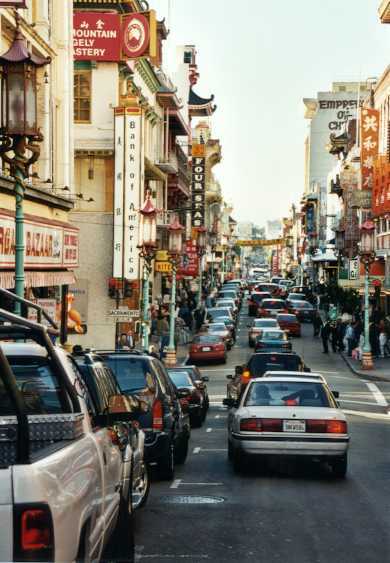 This part of San Francisco is called Soma. 17:34 I start a big city walk. 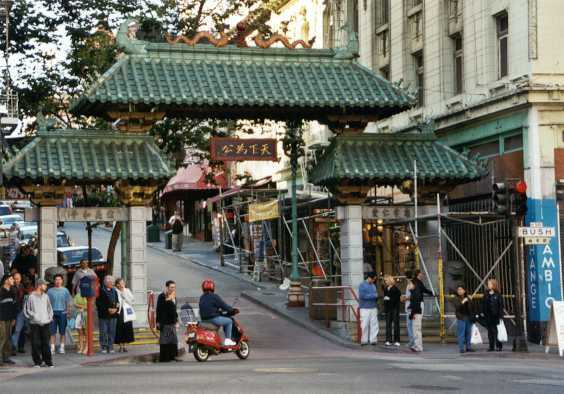 Up 5th Street and Powell Street to Union Square, then up Grant Avenue through Chinatown. 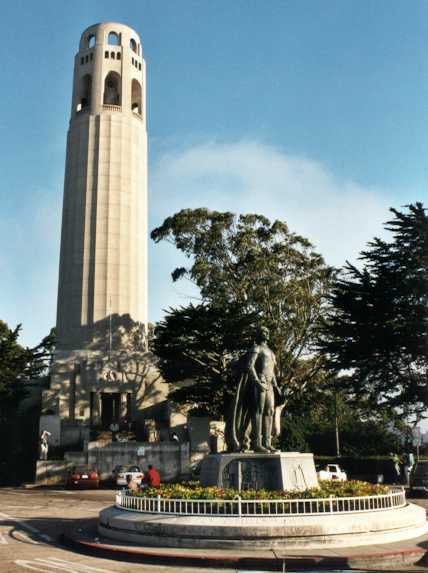 18:42 Walking up Filbert Street, I reach the Coit Tower on Telegraph Hill. This tower was built in 1933 and has a height of 210 feet (64 m). There is also a Columbus statue here. Telegraph Hill allows a nice view over San Francisco Bay and the city. I leave the hill on Greenwich Street, Grant Street, and head west on Francisco Street. 19:28 I queue up at the crossing Bay Street/Taylor Street to take the Powell-Mason cable car line back south. Some guy is singing and playing sax, while I wait in the strong, chill winds. 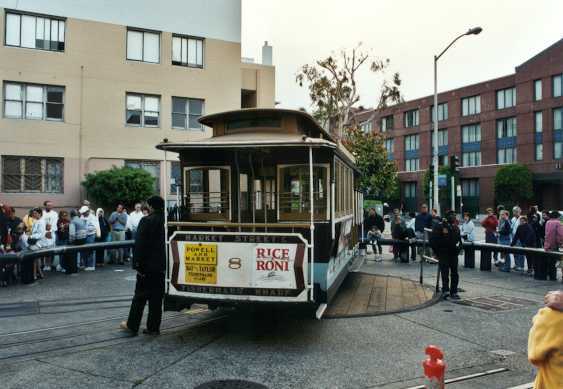 The cable car arrives after about 25 minutes, and is turned around manually on the ``Cable Car turntable''. 20:00 Finally, I'm on the cable car. One-way fare is $3. 20:15 I step out the cable car on Market Street, and go right into the next pizzeria, and fetch two slices to go. Then I walk back to the hotel. A homeless guy asks for some money, and I give him some pizza instead. 20:28 I'm back at the hotel and consume my pizza. 21:26 Now it's time to do some laundry. I ask the hotel clerk where I can find a self-service coin-operated laundry, and he points me to a place at Folsom Street. As I arrive there, there's no chance to get in, and the laundry turns out to be for residents' use only. At a gas station I am told another address, but that place is already closed. So I return to the hotel with my dirty clothes. I will have to wear a used t-shirt tomorrow. Yuck. 00:05 My city guide says that Folsom Street, which is nearby, is the place to go for night clubs in this part of town, so I go to the ``Holy Cow'', located at the corner Folsom Street/11th Street. A nice place, and the music selection is a good mix of 80's, current hits, and few classics. 01:27 Last call for alcoholic drinks. 01:50 The place closes; everybody has to leave until 02:00. On my way back to the hotel I notice that most locations are closing; only at the entrance of ``Ten 15'' there still is a long queue. 02:15 Back at the hotel. 10:08 I get up. As the water from the damp air settles in the bathroom, the words ``TE AMO MUIIIITO'' become clearly visible on the mirror. Not cleaned well, that mirror. 10:43 The phone rings. It's the receptionist, and he asks me if I am happy. And he wants to know if I'm staying one day more. I tell him that I will leave before checkout time, which is 11:00. 10:59 Fetching some ice, as usual, I leave the hotel room and make up the travel plan to Yosemite National Park, which is located about 170 miles east of San Francisco. I will drive through Oakland, Tracy, Stockton, Manteca, and Oakdale. 11:08 And off we go, first again across Oakland Bay Bridge. 12:11  I take a short break, just before Tracy. 12:47  Whopper Value Meal at Manteca. 14:19  As I pause at some information shed near Sonora, a friendly guy (junction information clerk Robert ``Buzz'' Baxter) tells me what I should see at Yosemite National Park. He also tells me that he has been to Germany, e.g., to Bremerhaven, Munich, and also to Austria and Switzerland. He likes German beer. 15:45  I enter Yosemite National Park at the Big Oak Flat entrance. The fee is $20, and covers several days. I will only stay today, until it gets dark. 16:18  The nice area makes me take a short break and take some pictures. 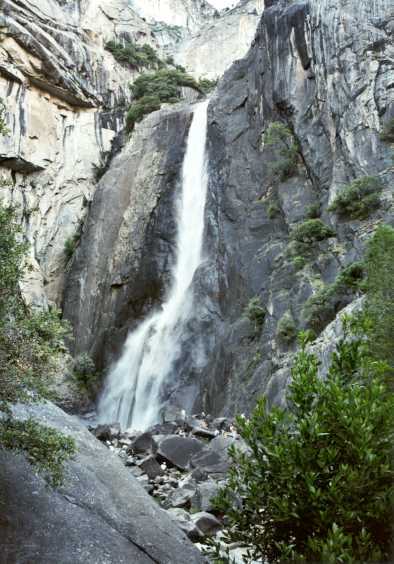 16:26  I take some pictures of Valley Portal with the Bridalveil Falls. 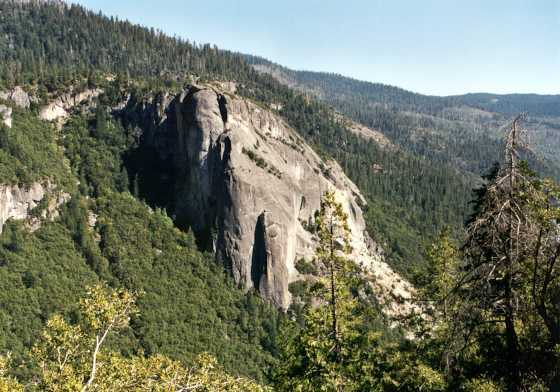 Also Elephant Rock can be seen from here. 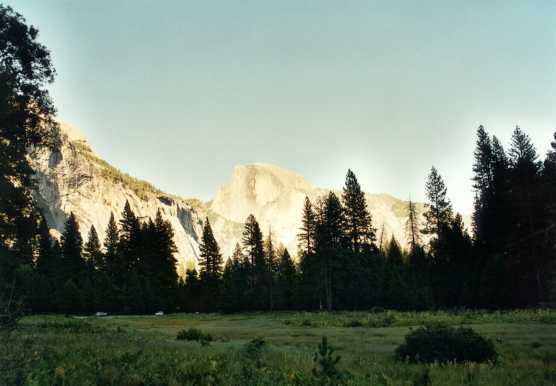 16:52  I park in Yosemite Valley, and walk to the Visitor Center. The way there is clearly marked with signs, but right at the front of a gift shop all signs suddenly disappear. This is intended, I'm sure. 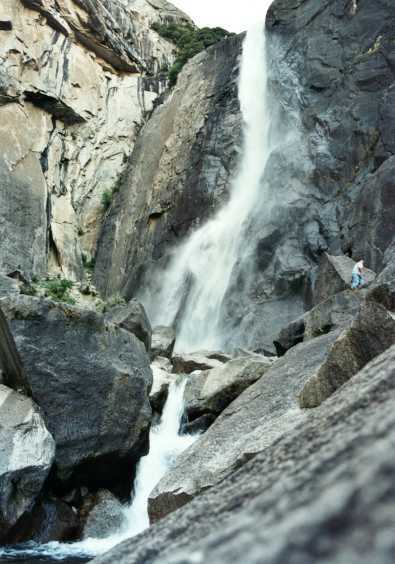 Nevertheless, I find the Visitor Center, have a quick look inside, and then proceed to the Yosemite Falls. There I take some pictures and make a sound recording. 18:35 I'm back at the car. That was quite a long walk. Fortunately, no bear has opened the car in the meantime, which is said to happen very often around here, especially if you leave food in the car, like I did stupidly. 18:45 Now I drive south, to Wawona. 19:42  Wawona, ranger station. I look for some information, but the maps I got at the park entrance turn out to be precise enough. 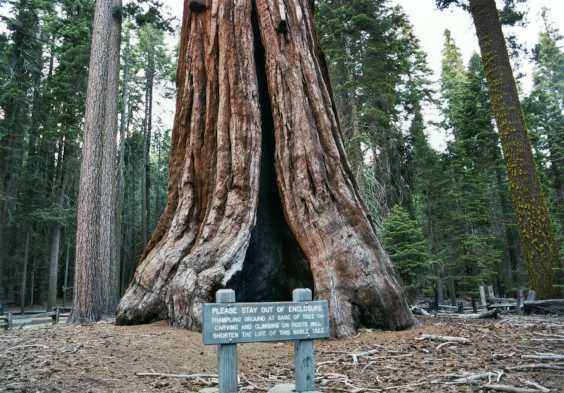 20:02  I park at Mariposa Grove, where some very large Sequoia trees are located. A sign says: ``Please stay out of enclosure. Trampling ground at base of tree or carving and climbing on roots will shorten the life of this noble tree.'' 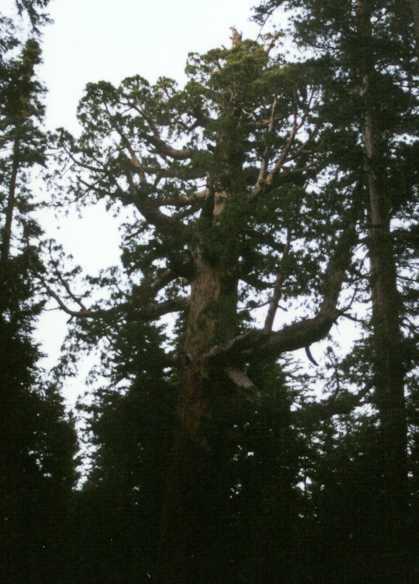 A long walking trail starts here, and I walk the first 0.8 miles to have a look at the ``Grizzly Giant'' tree, the top of which is touched by the last rays of sunlight. As I walk back, it is almost completely dark. Most of the way back I do not walk on the trail, but on a road nearby. At the parking place, a man is looking for his wife and kids, who seem to have gotten lost in the dark woods. I can't help him, since I did not see them on my way. As I leave, they finally return. 21:00 I leave the park southward, looking for a place around Oakhurst to stay for the night. 21:50  Shilo Inns, Oakhurst, room 407. A really big one, with microwave, coffee machine, and a refrigerator. The fridge and the air conditioning make too much noise, so I turn off both. 21:59 They have a self-service laundry, but it closes at 22:00. Not enough time, I guess. So I'll do my laundry tomorrow morning. 09:15 I get up, and turn the fridge and air conditioning back on. 09:40 Laundry time. I go down to the laundry room and start first the washing process and then my breakfast. 10:22 After breakfast, I unload the washing machine and put the clothes into the dryer. The drying will take one hour. 11:22 Drying has finished, I fetch my clothes and pack my things. 11:56 I check out and ask for directions to San Francisco. The clerk (his name is Ben) gives me a map and explains to me which roads to take. 12:13 I leave the Shilo Inn. 12:17  My last stop at a gas station. 13:00 I turn to the 140. 13:07  Now I've driven a thousand miles. There is road work ahead, and I am slowed down for some minutes. 13:59  I run over some debris of a tire. I hope nothing was damaged, that was quite a bump. 15:13  Pause at Springtown Center. 15:43 Okay, let's get back to San Francisco. 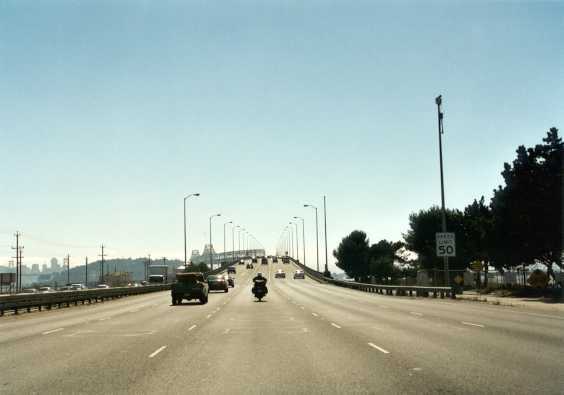 This time I take a bay bridge more to the south and then drive north to San Francisco International Airport. There I look where to return my car tomorrow. It's easy to find, and there are shuttle buses to the airport terminals. 17:07  The Ramada Inn, which I selected from a motel guide, is full. 17:23  The Knights Inn is full. 17:32 I make some phone calls to other hotels, and all are full. 17:58 Okay, I'll drive along El Camino Real, there are plenty of hotels and motels. One of them should have a room for me. 18:05  I got room 16 at Cable Car Inn. A total rip off, but I don't want to search any longer. 18:26 I unload the car completely and put everything into my room. There I use the commercial breaks on TV to transform my luggage into some transportable state. This takes very, very long. The ice from the vending machine outside is not usable, since I find some flies and dirt in it. I order a wake-up call for 05:00. I should complain about the ice, but I have no energy left for that. 20:10 One of the Big Brother chickens (the animals, not the girls ;-) squeezed its neck in some door and is nearly dying now. Almost everybody is deeply concerned about this, and one girl (Brittany) even starts to cry. The chicken is allowed to leave the house, and after it has been treated by the Big Brother vet, it is returned. I go to bed early (i.e., before 01:00), because I really need some sleep before the trip to New York City tomorrow.